Select Print Medium Fine Art Paper Canvas Select a Size 15x12 in. 21x17 in. 36x29 in. 42x34 in. "Ready for take off…" is the depiction of a big block of pink clouds. Gabriele Esau was born in Neuenbürg, Baden-Württemberg, Germany. From an early age, she loved painting and drawing as a means to represent her own fantasies, desires, and dreams. She decided against the initially plan to study art because its contents did not meet my expectations and instead opted for a science degree. However, her passion for art was always present. She taught herself by training through books, museums visits, exchanges with other artists, and personal experience. She initially drew pictures with color and graphite pencils and began working with oil painting in 2004. The content of her images is determined by the artist’s fantasies, perceptions, life, and love for animals and nature. For the artist, visual arts means an expression that starts where words are not enough and the camera can’t see anything.Gabriele Esau wants to make this visible through a realistic manner of painting. 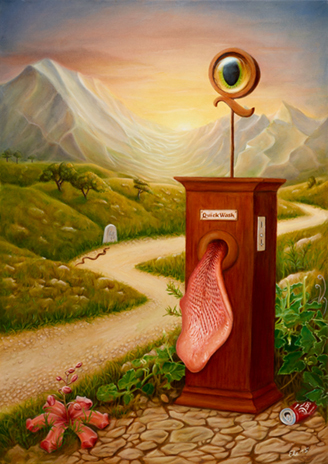 Her genre is surrealism and fantastic realism and preferred media are oil paints and graphite. 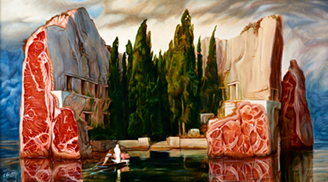 "Isle of Death" is the artist's version of Böcklin's classic artwork. By using a literal interpretation of the title, mountains were represented as meat-mountains to symbolize the death of beings. This is further highlighted by changing the coffin on the ferry to a pig. "Strelitzie II" is part of a small series, showing neglected but beautiful details from surfaces of plants (such as trunks).